The Dignity Rights Project sets dignity in action through public and professional education, advocacy, and support for high-impact lawyering. Human dignity recognizes the equal and inalienable value of every member of the human family. It is recognized in the International Bill of Rights and permeates the Sustainable Development Goals. At the national level, it is incorporated in more than 150 of the world's constitutions and courts around the world are increasingly vindicating dignity rights in civil, political, social, economic, cultural and environmental contexts. And yet, throughout the world, dignity is compromised, impaired, violated, and continually tested in ways that affect real people in real ways; among the most vulnerable to violations of human dignity are indigenous people, climate and war refugees, victims of domestic and political violence, and those who defend and advocate for them. "As constitutions explicitly protect human dignity, and courts [give it] meaning, people around the world increasingly develop a feeling of dignity – an internalized awareness of their own worth and of the power it carries." "The Dignity Rights Project seeks to make these voices heard and these injustices visible so that they can be addressed. It further seeks to make changes in law, policy, even in small day-to-day ways of doing things. Dignity is actionable through all sorts of channels that we will have to explore as well as create." EDUCATION: Public education, legal education, and professional training and workshop programs, and scholarship on dignity-related questions. ADVOCACY: Coordination and collaboration with governments, communities and members of civil society including dignity rights assessments. ACTION: Consultation, research, fact-finding, brief-writing, and oral argument for potential and ongoing litigation. We engage students, lawyers, and activists in a global conversation about the right to human dignity. The Dignity Rights Project works with partners locally and around the world to advance knowledge and capacity-building around the right to human dignity. Semi-Annual Dignity Rights Virtual Workshops inviting dozens of scholars from around the world to participate in a two-hour zoom conversation about the evolving law of dignity rights. Amicus Briefs on behalf of Law Professors in Juliana v. U.S., positing that the Constitution can play a role in addressing climate change. Read the 2019 brief here. Read the 2017 brief here. Webinar for human rights lawyers in the Middle East and North Africa working with PILnet. Submission to the United Nations High Commission for Human Rights on the dignity rights of children in the face of climate change. 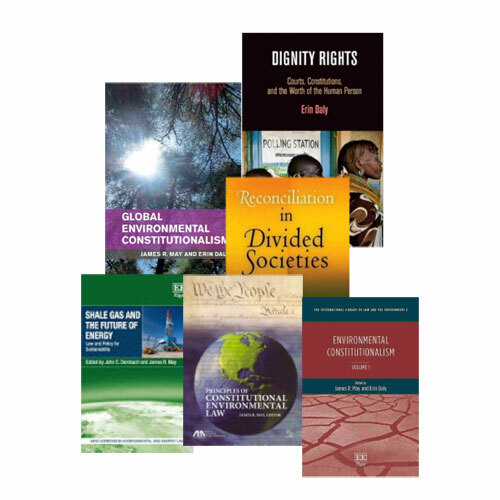 White papers on environmental injustice, educational injustice, discrimination, and the dignity rights of vulnerable and marginalized communities around the world. Simone is a 2L at Delaware Law School, and has written about holding private entities accountable for violations of human dignity. She graduated from Agnes Scott College in Decatur, Georgia with a bachelor’s degree in history. Our First Fellow, Rambabu Talluri, held an LLB and an LLM, as well as an MSW and a BA in Philosophy. Erin Daly is Professor of Law, Widener University Delaware Law School (USA), and Vice President, Institutional Development, UNIFA (Université de la Fondation Aristide) in Haiti. She is the author of Dignity Rights: Courts, Constitutions, and the Worth of the Human Person (Penn Constitution and Democracy Series) and the co-author of Reconciliation in Divided Societies: Finding Common Ground (Penn Series on Human Rights). She also directs the Global Network for Human Rights and the Environment. She was interim dean of the Law School 2013-2015.The Dignity Rights Project is co-directed by Erin Daly and James R. May. James R. May isDistinguished Professor of Law, Widener University Delaware Law School (USA). He is the author or co-author and editor or co-editor of 10 books and more than 100 articles and chapters, including Standards of Environmental Rights (Cambridge University Press), Principles of Constitutional Environmental Law (American Bar Association) and co-editor of Shale Gas and the Future of Energy (Edward Elgar). May has been inducted into Phi Kappa Phi and the American College of Environmental Lawyers. His work focuses on comparative environmental constitutionalism and dignity rights. Jointly and separately, they have also written numerous articles and chapters on environmental law, comparative constitutional and international law, and transitional justice. Chester Environmental Partnership, Chester, U.S.
Lenape Indian Tribe, Delaware, U.S.